There’s so many plants that could make the honour of plant of the week at the moment, those plants have so many attributes like flowers, leaf and stem colour and berries, it makes my job of choosing one beautiful plant for my Plant of the Week so hard. This week I have chosen one that has really great autumn foliage but unlike many, it’s a pretty smallish shrub, indeed this form of the Mountain Witch Elder takes up to 10yrs to gain its maximum height of 2m. It is a member of the Witch Hazel family and was named in honour Dr John Fothergill, an physician, who in the 18th century, was one of the earliest collectors of North American plants, all kept in his garden in Essex. He also helped to fund several plant hunting expeditions in North America. The first Fothergilla to be discovered was a form called F.gardenii in 1765. It was discovered by Dr Garden, a Scottish physician based in Charlestown in South Carolina. Dr Garden spent over 20yrs discovering the local plants and wildlife and sending quite a few new plants back home to the uk. No one knows who or when F.major was discovered but it has certainly been documented to being grown since 1780. Its native habit, it grows 500m above sea level in the mountains though North and South Carolina and into Georgia and Alabama. It grows in light woodland often under Plants like Quercia coccinea, rubra, Lirodendron tulipifera and Magnolia fraseri. In these environments, it can grow to 6m in height although rarely achieves this in our gardens, with this group Monticola being a bit smaller too. It can be grown on most types of acidic soil from sand to clay but does prefer it to be free draining very fertile soil with lots of humus. It is good to grow in full sun or semi shade and is one of the few plants that will grow away comfortably in any aspect whether it’s North, South, east or west. The flowers are borne in late March, early April and appear just before the leaves, it was the flowers that made me first notice this plant when I was only 18yrs old and working at Hilliers Garden. 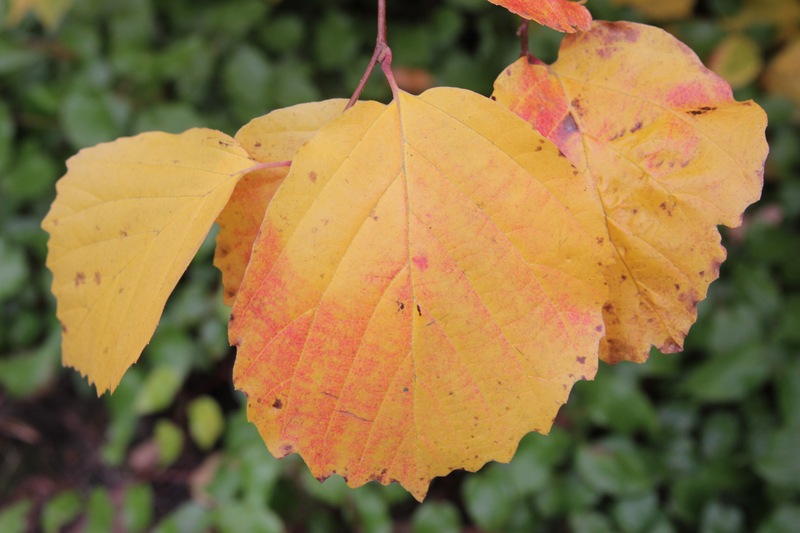 The leaves when they appear, are a good green colour but turn this stunning mix of colours in the autumn months. It is pretty easy to propagate as well, either softwood cuttings taken early summer works or air layering a branch during the summer works equally well. It doesn’t need any real bits of pruning, just removal of crossing branches, taking out any dead wood and just generally shaping it up if required. This work is best done during the winter months. It can be found growing in gardens like Sir Harold Hillier Gardens and the RHS gardens like Wisley. It can be brought from such fine nurseries like Burncoose of Southdown. Next post: October, the neither month! Beautiful! I’m not sure that I’ve ever seen the true F. major, despite it growing naturally in this state. All the nurseries around here sell ‘Mt. Airy’ which is supposedly a hybrid of F. major and F. gardenii. ‘Mt Airy’ has flowers that smell like licorice at night. I wonder what parent that trait comes from. I have not seen this in quite a few years. We grew a small quantity of it for a while, back when we were growing hazels, but like the hazels, the market was limited. We eventually discontinued production. They grew well here, and colored superbly in autumn, they are just not what people want. Not many people here are from here. They plant whatever is available in nurseries. The growers do not get to dictate that. I would like to popularize junipers again, but it won’t happen. They have a bad reputation, and the retailers would rather promote something that is less sustainable that they can sell more of. The one time that the hazels were briefly popular was when a pair of standard (tree shaped) filberts were exhibited in a landscape at the big show in Seattle. They looked ridiculous; but they started a trend for a little while. Stunning – and very informative!